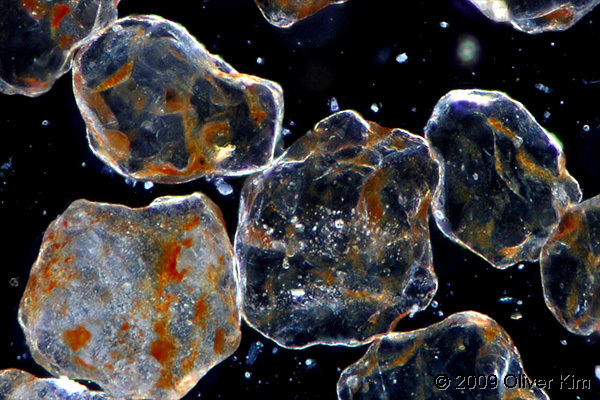 Sand from the Kalahari desert under the microscope. Dark field illumination. This image is a stack of six separate pictures. This way the depth of field could be increased. The bright spots on the dark background is dust, which becomes especially visible using dark field illumination. The image was slightly sharpened. Under the microscope it is evident that the individual sand grains are transparent, something which is not evident when looking at the sand with the unaided eye. Sand is made mostly of silicium dioxide (SiO2). Glass is made of the same material. The red patches on the individual sand grains are made of iron oxide. The Kalahari Desert covers large areas of Botswana, Namibia and parts of South Africa.